There was an hour long guest lecture organised for the MET MBA and Mass Media students on ‘Brand Building’ on October 08, 2013 at the MET Convention Centre. This lecture was delivered by Mr. Willem Woudenberg, founder CEO of ‘Brand Dialogue’, the company based out of Amsterdam. He was in India on a business visit and was willing to educate and share his learnings with the students on the different facets of branding and how it has evolved over the years in India and globally particularly from Netherlands perspective. However, he also marked the importance of understanding & developing the brand ‘You’. Willem emphasised on Experimental Marketing, which allows the consumers to become active participants in any marketing effort to experience the brand closely. He concluded by highlighting new trends and amoebic nature of the branding Industry. The integration of Mass Media and MBA students made this session more interactive and productive. 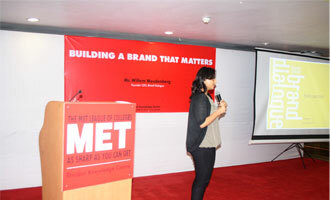 It was a full on learning experience on brand building for all the MET aspirants.